This is my first summer back in Northern California in almost 10 years. I forgot how wonderful it is to be free of humidity! Definitely a perk. I also forgot how cold it can be at night, or on a foggy day. Given that combo, it's nice to come home to a warm meal for dinner, which inspired today's recipe for Paleo Slow Cooker Chili. 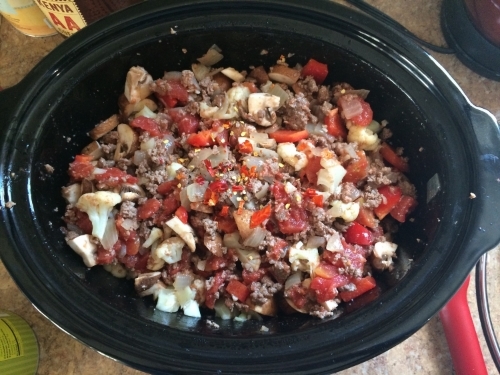 There are many amazing things about using a slow cooker, including setting your ingredients in the morning and coming home to a hot and ready meal that night. The slow cooker also doesn't emit much heat while it's in use (compared to the oven or the stove), making it a perfect choice for those summer days when your apartment is already warmer than you might like. I originally ran across this recipe when I went to make chili in the winter, and realized we were out of chili powder. Turns out you can sub hot sauce for chili powder. Since we ALWAYS have hot sauce on hand (it is an essential breakfast component, more on that later) this was a great solution. The man and I liked the hot sauce variation so much, we have been tweaking this recipe ever since! Poor TrashCat--she thinks the can opener means TUNA! Sometimes it's just tomatoes. Start by browning your beef with a little salt and pepper. When all the pink parts disappear, take it off the heat and put in in the slow cooker. Put the lid on. Dice up your veggies. Saute the cauliflower pieces, garlic, and onions until the cauliflower is al dente. You don't want it to be too soft, because it will cook and soften more in the slow cooker. At this point I added some smoked paprika to the cauliflower, because yum! And it looks pretty in the pan. Dump everything into the slow cooker, I added some extra hot chilis here, again partly because I wanted a little extra heat, and also because garnish makes a pretty picture! Douse the contents of your slow cooker with chili pepper sauce. Mix well, put the lid on, and cook on low for 4 hours. I was really happy with how this chili came out. The mushrooms added a lovely depth of flavor, the cauliflower made it filling, the seasoning made it spicy/sweet/tangy/smokey. And it held up well for leftovers and re-heating. My general strategy for keeping my nutrition on track is to make a big batch of 2 different things on Sunday that we can eat for lunches and some dinners for the week. I am all about efficiency cooking. This recipe will definitely stay in the rotation. Try this recipe and this strategy and let me know how it works for you.